Back to school time has arrived! All social network sites are almost loaded with back to school photos of the kids, uploaded by their parents. Everyone is trying to display their kids' new backpacks, dresses, crayons and other school supplies, which are high in demand. Although, some parents have not yet completed their shopping and still hunting stores to stores. However, while scrolling down my Facebook page, I noticed a status of my friend that her son Robert, is very specific with his school supplies, even at 7 years of age! And, this made me realize that how kids are aware of their parents’ financial status and make the choice accordingly. But, this is certainly not good for a child's upbringing, as this attitude towards life can ruin his/her financial future. To be very honest, I had picked the topic “back to school money lesson” for a certain reason. I know, students, especially teenagers, are very much interested about this event and they can involve themselves with this occasion easily. And, I can relate them while sharing some financial wisdom. 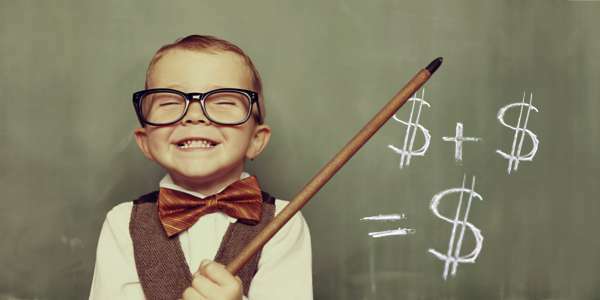 Though your child is just a teenager or a toddler, it is very important for them to learn about the importance of money along with the way in which they can manage it well in the future. But, often you feel anxious and ask yourself the question “how to start talking with them about money?” or “how to pass on money lessons to a teenager?”. Then you conclude with a simple line, i.e. “These are the tasks of a teacher not us”. Am I right? But remember, along with other lessons, your kid’s first money lesson, will start from the home. How? Your search is over. You can get the answers here in my article. Read thoroughly. Talk to your kids and create two separate lists of wants and needs before heading the store. Ask them to mark their highest priority to lowest priority things. Thus, you will be able to involve them in the decision making process. Skip the lowest priority items and explain to them the difference between wants and needs. How wants will be excluded when money is limited and a budget is there. The sooner your child starts to understand the value of money, the better he/she will respect money in their life. So, it’s a right time to tell them about credit cards, debit cards, cheques. Make sure, you have explained all their advantages and disadvantages as well. Explain how money plays an important role in our life and why we shouldn't underestimate its importance. However, we should not earn money in an unethical or illegal way as, it can create havoc in our lives. Once you have made the shopping list, then ask them to help you to make a budget for the shopping. Though the task is quite tough, but you can do it. Learn how. At first, fix a certain amount of money (not big amount). Try to find out the last year shopping bills of your back to school supplies. Try to make a rough estimate of all the items. Thus, you’ll be able to know whether or not your budget is ok with the items you’re going to buy. If the expenses exceed the budget, then ask your kid to reuse his/her elder’s backpack or continue the same lunch box for the year. Thus, that money can be spent on buying another important item. However, your kids may feel disappointed as they are not getting the item they want. But, you should explain how this can be beneficial for them. And by doing this, they will start saving money to get other things as well. Remember, you will have to make your kids understand the need of savings in their life. But, they may feel less interested. So, tell them how splurging on a sale can be beneficial as you’re getting the item for less price and saving some money at the same time! Tell them, saving money in any form is good to get a secured financial future. You will have to make your child understand that doing your own work is always appreciable. Keeping the attitude “I have money I can get anything I want” can ruin their future. Try to make them compassionate, tell them to share some household chores with you. Make them feel that household chores are easy to complete and they should do their own. Thus, they will be more responsible in the future and grow up as a sensible person. Tell them, even if you have huge money, then also, it would be better to do your own household chores as this help you save big. Money always gives a secured future, so you should always think about it. Remember, only educational knowledge is not enough. Your kids should have a clear idea of what they want and what kind of work is actually going to help them in future. So, if the situation requires a significant squeeze in budget, then they'll have to do it in order to manage the situation for the time being. For instance, tell them, life has its ups and downs, they may face money problem in their life. So, they should adjust their lifestyle and know how to live within their means, for their own good. Thus, they will be able to avoid financial problems in the future. Yes, it is good to learn some basic money lessons in life as these can help to manage money and finances well. But, things will become more difficult when they start using debit or credit cards. Having multiple cards in their wallet, they may feel, there's no obligation on buying and spending money lavishly. You should be more careful before giving them a bunch of plastic cards without sharing enough knowledge. So, always tell them the right way to maintain them along with explaining both the good and bad effects of using plastic money.